This tour lasts for four days. During these days you will visit a couple of most beautiful natural attractions of the Kingdom of Morocco. We will start from a private tour in Marrakech. Most of the people who have been there note its matchless red-brick color. It used to be called as the “Morocco City”, and was considered to be the “Pearl of the South”. It is no mere chance that Marrakech had all these big names. Marrakech continues to be a very important city in the whole Morocco. You would definitely enjoy the city tour because Marrakech combines modern neighborhoods with an old fortified city. One of the most popular attractions of Marrakech is the Koutoubia Mosque, which is a twin tower of the Giralda Tower and the Tower of Hasan. Afterwards we will proceed to Ouarzazate. On our way you will have an opportunity to enjoy the marvelous view of the high Atlas Mountains and countless Berber villages. Soon we will reach the so-called “Hollywood of Africa” – Quarzazat, and proceed to “Road of thousand Kasbahs”. You will be amazed at the beauty of the sand-castles. We will also make a stop in the “rose city” – Kalaat M'Gouna. 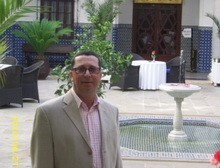 As your private guide in Morocco I will be assisting you during the tour. Todgha Gorge is our next destination. It is a beautiful natural canyon, which attracts numerous tourists each year. Probably the most exciting part of the tour will be riding a camel and exploring the desert. Our last destination will be Fes.